Family Promise of Lubbock proudly invites you to attend the upcoming Family Promise Annual Gala to be held on Thursday, November 10, 2016 at 6:00pm at MCM Eleganté Hotel & Suites. Guest Master of Ceremonies for the evening will be the Honorable Mayor of Lubbock, Dan Pope. Entertainment will be provided by cast members of "Phantom of the Opera"
All proceeds benefit Family Promise of Lubbock's mission to provide homeless families with children the tools necessary to escape homelessness. BID TO END HOMELESSNESS ~ Be sure to come prepared to bid on fantastic auction items! See for yourself! 2016 New Honda CRF 50F Kids Dirt Bike donated by Family Power Sports. Retail Value $1800 + Tax! All proceeds to benefit the homeless families served by Family Promise of Lubbock. 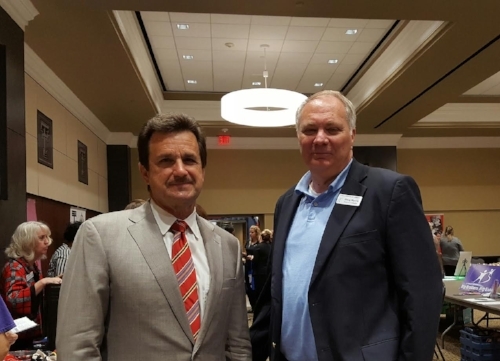 On Tuesday, September 6th, Family Promise Executive Director, Doug Morris and Volunteer Coordinator, Elpidia Paniagua attended the Statewide Employee Charitable Contribution Kickoff at Texas Tech University. The SECC Annual Giving Campaign afforded Texas Tech employees the opportunity to visit with nonprofit agencies, participate in on-site service projects and make a pledge to their charity of choice! A huge thanks to TTU President, Dr. Lawrence Schovanec for his inspiring remarks and for taking time from his busy schedule to meet Doug and Elpidia and even pose for a picture! Great News! Chick-Fil-A is hosting a Back-to-School Supply Drive to benefit the school age children at Family Promise of Lubbock between now and August 16th. You can help by donating a new and unwrapped school supply item and place it in the yellow school bus located in their main lobby. Guests who donate a new backpack will be entered to win FREE Chick-fil-A for a year (52 combo #1 cards). Locations: Chick-Fil-A on 69th & Slide and 82nd & Milwaukee in Lubbock, Texas. Please support their fundraising efforts by copying and sharing this flyer with friends and family and by dropping off your donation at any of the participating locations. We love our Sponsors! Thank you Chick-Fil-A for your support of Family Promise and the many families we serve! The school supply drive will ensure that our children start off the school year successfully! Thanks for making a difference in the lives of these children who are experiencing a very difficult time in their lives - homelessness. On Thursday May 12th, Family Promise of Lubbock hosted its Spring Luncheon of 2016 at Second Baptist Church. This event allowed us to showcase some of the reasons Family Promise never stops fighting to end homelessness. Members of our families told their story of struggle and perseverance. One of our best resources, our volunteers, also shared why they feel it is important to give back. Along with all of those who were in attendance, we would like to thank our volunteers, caterers, Board of Directors, and our families. We would also like to thank Madeline Frost for taking pictures during the event. Stay tuned for more events and news on Family Promise of Lubbock. The fight to end homelessness is not over, but with your help, we are headed in the right direction!